Create your personal game cards! Design your custom deck of game cards with your favourite pictures on PersonalGameCards.com! Perfect as an exclusive gift for friends or family. 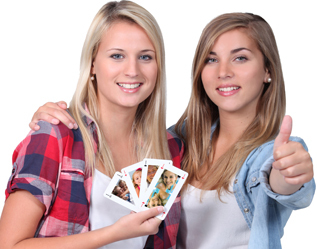 Use your personalized playing cards for a game of poker, duplicate bridge and Crazy Eights. Customize them with more than 50 photos! In a click of a button, you can create an unique and personal gift for your brother’s birthday, your best friend’s wedding or your colleague’s work anniversary, by using our online card game configurator. Select photos from your last holiday, party or photoshoot and start to customize a traditional card game! You can use the software without registration or signing in. Upload your favourite pictures in the configurator and create your custom game cards at PersonalGameCards.com! All 53 cards could be redesigned with your own photographs, graphics or logos. It works easy! All you need is a selection of your favourite pictures and a little time, of course!